Prince William, who rarely speaks about his mother Princess Diana's death, comforted a young girl who was mourning the loss of her father at a charity event in Stratford, London today. “Do you know what happened to me?" 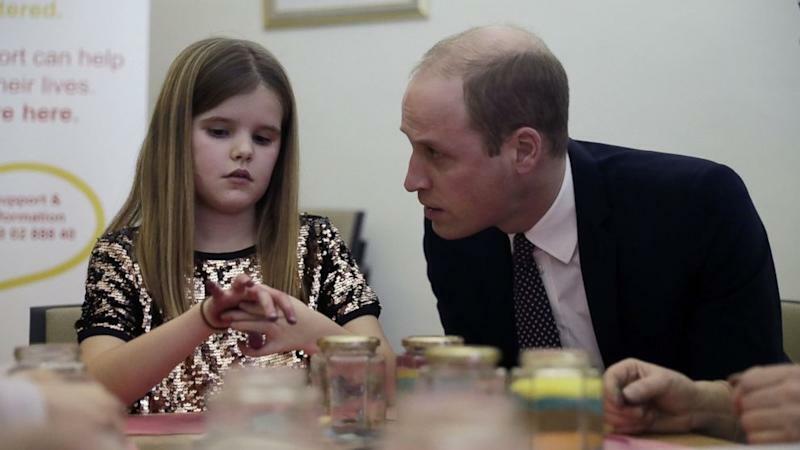 William told 9-year old Aoife, who lost her father to pancreatic cancer six years ago. "You know I lost my mummy when I was very young too. I was  and my brother was 12. So we lost our mummy when we were young as well. William is royal patron of the Child Bereavement U.K. Centre, a charity that helps families deal with the loss of a loved one. Aoife’s mother, Marie, spoke to journalists after the event and said the conversation almost brought her to tears. “I couldn’t believe it when he started to talk about his mother. It was very emotional and I was willing myself not to start to cry. I almost did,” she said. William and Kate met with children at the facility in Stratford today and encouraged them to create memory jars to help them deal with their grief. The Duke and Duchess of Cambridge and Prince Harry have made mental health awareness a key focus of their charitable activities this past year and are encouraging children to open up and ask for help if they're suffering. The royal trio has been praised for their work on mental health and their ability to empathize with young people struggling with life's challenges. William admitted to the children he was very angry about his own mother's death. One of Princess Diana's closest friends, Julia Samuel, founded the charity in 1994 with Diana's support. William took over as royal patron of the charity in 2009. William and Kate named Samuel one of Prince George’s godmothers. William and Harry are commemorating the 20th anniversary of the late Princess Diana's death later this summer. The Duchess of Cambridge accompanied William to the engagement in a royal blue coat dress by the designer Eponine. Earlier in the day, Kate attended her first engagement of the new year. The young mother stopped by the Anna Freud National Centre for Children and Families’ early years parenting unit and met with young mothers who have had to overcome family life battling addiction and abuse. Kate encouraged the women, conceding "parenting is tough" no matter who you are or the circumstances you encounter while raising children. Kate also visited with young mothers of children struggling with personality disorders and mental health challenges and commended them for their work.